VietNamNet Bridge – Local music fans are grabbing tickets to see world-renowned disco bands Boney M and Joy perform live on March 8 in Hanoi. The Boney M & Joy Live in Concert, part of the Legend Concert, will bring local fans a music night with famous melodies of the two bands. The concert is scheduled for 8pm on March 8 at the National Convention Centre, and tickets are already on sale for prices between VND1 million and 4 million (US$43-172). Boney M will sing hit songs from their album Boney M 79 and some songs by famous divas like Celine Dion and Whitney Houston. This will be Boney M’s third performance in Vietnam. 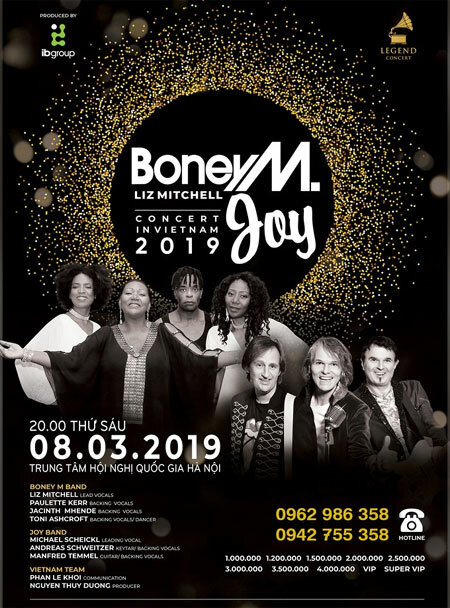 They first hit the Vietnamese stage in the concert Boney M & Chris Norman ex Smokie in Viet Nam, mesmerising nearly 4,000 audience members in 2016. Ahead of this concert, Liz Mitchell reflected on their first performance in Vietnam. She said she was moved by seeing local audiences dance and sing along with the band. Returning to Vietnam this time, Mitchell said she wanted to try more Vietnamese dishes and visit bún chả Obama (the local eatery where US president Barack Obama and chef Anthony Bourdain once ate bún chả – rice noodles with grilled pork) in Hanoi. Boney M will share the stage with the Austrian disco trio Joy. The combination of the two groups is expected to turn the stage into a huge dance party. Boney M has been one of the favourite international bands of Vietnamese fans since the 1980s and 1990s. Some of their hit songs including Jingle Bells, Daddy Cool, Rivers of Babylon, Ma Baker and Mary’s Boy Child have become familiar melodies for local fans. Meanwhile, Joy, which will perform in Vietnam for the first time, is a band made up of members Freddy Jaklisch, Manfred Temmel and Andy Schweitzer, founded in 1984 in the city of Bad Aussee, Austria. The band is known for songs like Touch by Touch, Hello, Valerie and Japanese Girl.